an abstract electronic image they say is Baghdad. I don’t know Baghdad, but I do know Albany. firing Cruise missiles at the Empire State Plaza, at the Governor’s Mansion on Eagle St.
Bombers’ Burritos blasted to bits by its namesakes. takes out my house, rattles the windows of St. Peter’s Hospital. die in an explosion in the parking lot. The sound of planes overhead, the trucks on New Scotland Ave.
are the invading army, blasting into Albany. by nervous tankers as she drives across the Normanskill Bridge. downtown St. Mary’s Church burns, City Hall collapses. no poetry can be heard on Lark St., or Hudson Ave., or North Pearl. (the enemy says it was a cynical and evil move to place a military facility there). next to the broken bottles of what was once Justin’s. is mistaken for a command center and hit by a bunker buster. but I do know Albany. 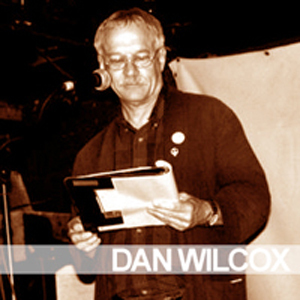 Dan Wilcox is the host of the open mic at Lark Street Bookshop in Albany, N.Y. on the third Thursday of each month and is a member of the poetry performance group “3 Guys from Albany.” As a photographer, he claims to have the world’s largest collection of photos of unknown poets. He has been a featured reader at all the important poetry venues in the Capital District & throughout the Hudson Valley and is an active member of Veterans for Peace. He also publishes poetry under the imprint, A.P.D. (albany’s poetic device, another pleasant day, etc. ), the alternative press for Albany’s poets, including such poets as Anthony Bernini, Rachel Zitomer, Don Levy, and Dina Pearlman. His own poems have been published in Out of the Catskills, The Second Word Thursday Anthology, We Speak for Peace, Chronogram, in numerous small press journals and anthologies, and on the internet, and he was a finalist for the 1998 Allen Ginsberg Poetry Awards.